For a blogger, it’s hard to gauge how well we can create engaging content. Some days, we’ll be churning out articles left and right, and other days, you might be staring at a blank page for hours. Trying to be an efficient blogger is no easy task but there is a way to do it. All you have to is apply the 80/20 rule of writing. 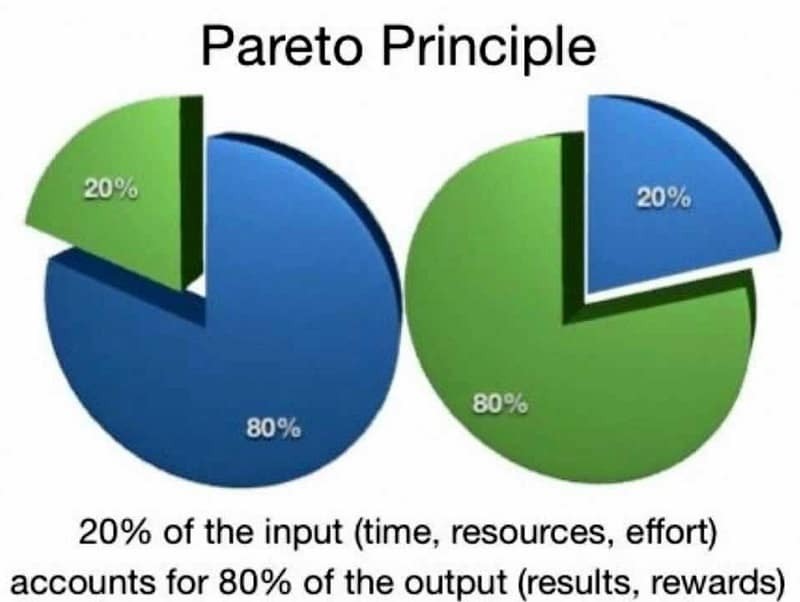 The 80/20 rule is actually a principle discovered by Italian economist and sociologist Vilfredo Pareto. It was based on a study he conducted back in 1895 where he discovered that society will naturally divide the bulk of the money and influence to the “vital few” or the top 20 percent, while the “trivial many”, or the bottom 80 percent, receives the rest. 80 percent of your site’s traffic comes from 20 percent of your audience. 80 percent of an article is research while 20 percent is the actual writing process. 80 percent is marketing while 20 percent is content creation. There are some caveats to this, in that the numbers can skew to 70/30 or even 99/1, but generally the balance will always fall within the 80/20 range. While the principle was founded on economic values, the 80/20 rule can generally be applied to all aspects of life. From businesses to time management and even technical issues, you will find that knowing what to focus on will greatly enhances your productivity, efficiency, and even in life. Supermodel Miranda Kerr and actresses Olivia Munn and Cameron uses the 80/20 rule when it comes to dieting and keeping their body healthy. By focusing 80 percent of their diets on healthy foods while the remaining 20 percent on indulgences, they managed to maintained their slim figures. But how does that apply to you? Well, the 80/20 rule can help you determine how to efficiently work on the things you need to do and get results that you want. Before we take the 80/20 rule and use it in your writing, let’s break it down first and see how it can be applied to you as a person. 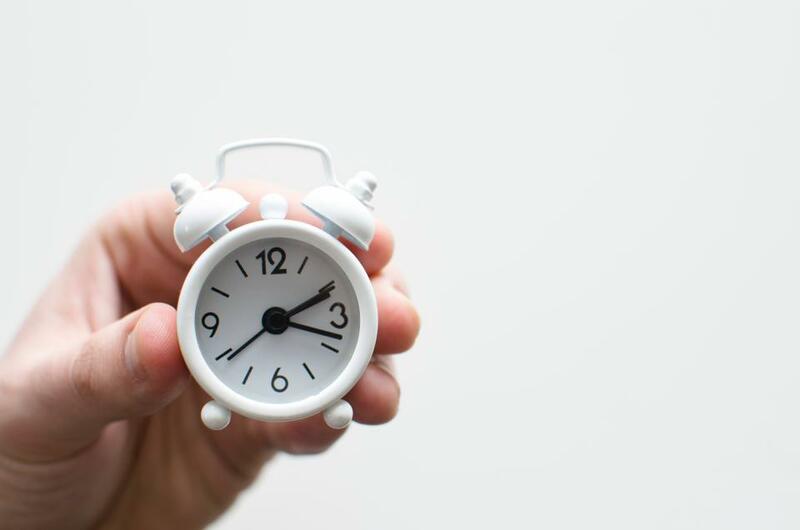 Generally, for most people, we waste 80 percent of our time on menial or unimportant tasks while only 20 percent of it is when we actually do something productive. The key here is to identify what is it that you’re wasting 80 percent of your effort on and divert it to the important or “vital” 20 percent of your work. This could mean spending less time in your office doing the trivial tasks, i.e. checking emails regularly, writing down memos, mulling over unimportant decisions, etc; and focus on the 20 percent of your job that actually gets you noticed by superiors. When it comes to creating content, instead of broad topics that are covered by 80 percent for bloggers, focus on the niche 20 percent that you’re passionate about and be an authoritative voice on that topic. So now that you’re familiar with how the system works as a whole, how do you apply it to your writing? First off, you need to find out what topics or articles is generating the most traffic and engagement on your blog and focus on creating more of them. In order to do that, there are a few tools that you as a writer and content creator should be familiar with. One of the most important tools that every blogger should have is Google Analytics. From tracking the numbers of visitors to your website, to knowing what demographics you’re attracting, Google Analytics is a powerful tool that is easy to set up and implement to your website. Google Analytics is an absolute boon for bloggers as it can help you narrow down to what content you’re creating that users are responding to. Which part of your site delivers 80 percent of the traffic? Which 20 percent of your blog is the highest performing content? How can you improve the top 20 percent of your content? These are the questions you need to answer by understanding the data from your website. Using web analytics is great way to find out what are generating traffic on your website, but don’t be bogged down with just your own stats. Social media is a great space to discover content ideas and to research what content is engaging audiences through shares and likes. With over 2 billion social media users, generating your content that’s relevant to the mass market is a sure-fire way of getting eyes on your website. Facebook generates around 3.2 billion likes and comments. For a content creator, that’s a data goldmine and finding out what the top 20 percent content that’s being shared and liked can help with your content. A game-changer for today’s blogging and content creation landscape is the influencers. Influence are public figures who are the authoritative voices of their respective field and for a blogger, networking with influencers is key to a successful brand. A key partnership with the right influencer can net you double the leads and client retention than a normal paid advertising would. Finding the right influencers might take a little bit of digging. A few tips would be to search for key figures within your industry or by searching in various social media platforms (i.e. YouTube, Facebook, Twitter, etc.) with keywords related to your field. Use tools such as Klout to measure an influencer’s score and determine the top 20 percent in your industry and reach out to them. Of course, it should be noted that the scores are merely guidelines and you should ultimately form relationships with influencers who you feel can benefit your blog. The hardest part of being a blogger is often not the writing, it’s the distraction that keeps us away from writing. This is why a lot of the times, bloggers and writers tend to waste 80 percent of their focus on unnecessary or unimportant tasks. It’s all too easy to fall into a routine of running endless errands or jumping into a rabbit hole of researching. Being an efficient blogger means you shouldn’t be spending more than 20 percent of your time on the “time-wasters”. 80 percent of your time should be devoted to creating and marketing your content efficiently. But, in order to do that, you’ll need to cut out all the unimportant distractions which can take a toll on your concentration. For starters, for the entire duration of your writing, ignore unimportant emails. Newsletters or emails that are not relevant to your work should be off-limits until you’ve reached about 80 percent of your work done. I’ve mentioned the power of social media before, but social media can also be a major distraction to bloggers. The best practice is to lay off any social media engagement (posting, liking, etc.,) and keep it strictly for research and communication with key influencers within social media. Remember, the idea is to have as little distraction as you can to focus on your writing. 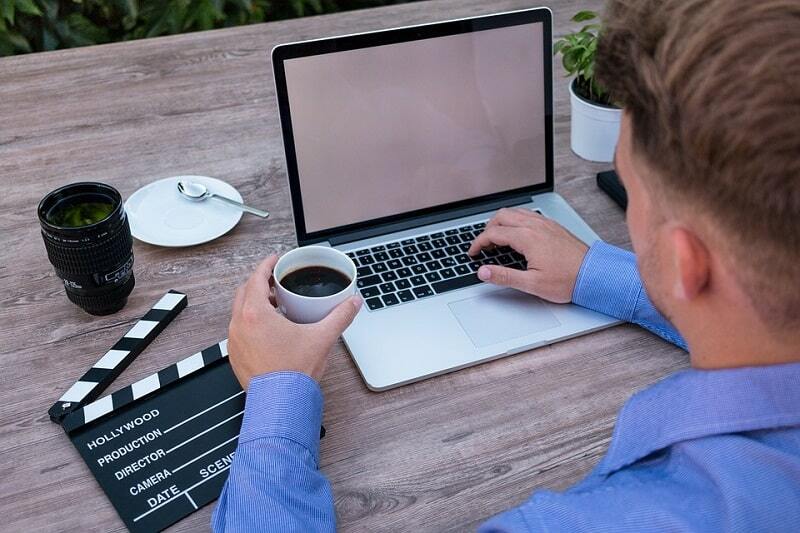 Once you’re done with your writing, get back on social media and use it to promote your content on all the major platforms and through influencers that you’ve established connections with. A major pitfall that writers and blogger often fall into is researching and writing on topics that are not relevant or engaging to their audiences. This happens a lot with new writers who feel that they need more content to counterbalance their lack of experience in creating quality content. While content is king, quality content is what audiences will come back to. So, before you start writing, always know whether what you’re writing is what people want. Use tools such as Google, audience engagement on social media, web traffic to zero-in on what content your audiences are reacting to. Plan your content properly by researching on topics beforehand and setting up a schedule for when to roll out articles on your blog. This will not only streamline your output, but will make you more efficient in planning content releases. It’s evident by now that the 80/20 rule can be an immensely helpful system for writers and bloggers to be more efficient. Sure, the simplicity of it means that you could apply it beyond writing, but not all of life can be fitted into the 80/20 way. It’s important to remember that the Pareto Principle is not exact science, rather, think of it as a tool that can help you improve your productivity and become a better writer. 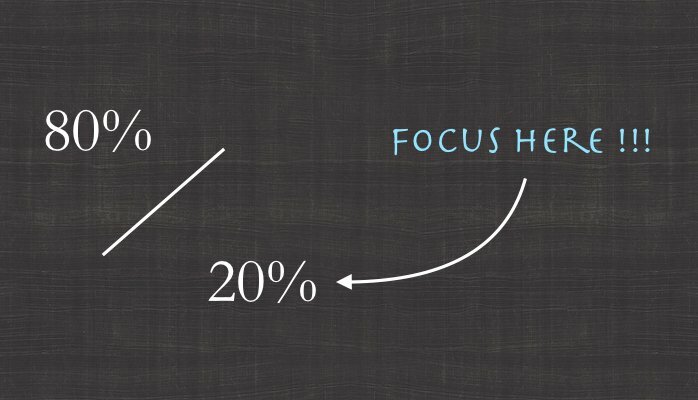 For bloggers, the 80/20 rule is a useful tool to have in your arsenal. Knowing which audiences to focus on (the 20 percent that keeps you in business) or which content to improve upon (the 20 percent that drives traffic) will be a tremendous asset in growing your blog and brand. Ultimately, it’s up to you how you should apply the 80/20 rule because at the end day, a tool is only as useful as its user. Great tips and so true, It’s so easy to spend time on tasks that don’t matter. When I first started my blog, I was spending my time everywhere. It was so easy to get caught up in those tasks that don’t make a huge difference. Today, I make it a point to write 1,000 words per day. It’s taken a while to get used to writing every day. However, when you start practicing and doing it every day. Eventually, you’ll realize how easy it is to get into the habit of creating content on a regular basis. Oh and make sure that you’re providing content that has already been proven to work according to Google Analytics. I have to delve into my analytics more to see which type of content is doing best, I usually can tell by the comments and shares on social. But looking at the Google analytics will be very helpful. Lisa – Cheers! I am glad that you like the article. Great tips over here on how to get going with the 80/20 rule. There is lot of things which I am learning here for the first time and how this rule can be added up into a bloggers life and how one can create a win win situation from this one. hours, as they like to keep the clock ticking. and publishing it on the air. It can happen, we just need to shift our priorities and make them shift in that 20% reign so that in less time we can be more productive. Thanks for the amazing share. I don’t think I have ever seen the 80/20 rule applied to blogging, however it makes sense. Applied to blogging it would be double your traffic. I think there’s a lot of truth to the concept even if the math isn’t exact.